He was a stout man with thick fingers who willingly engaged your ear, although following his hackneyed conversation style was akin to skipping alongside Dorothy through an endless field of soporific poppies. With a great big beer belly that was kept snuggly in place by faded green suspenders, the grizzled ex-landscaper could be seen almost every morning tending to his retirement project while periodically sipping from an oversized mug of coffee. I really appreciate that Nelly. Thank You so very much. We had that neighbor!! (minus the beer belly)– well done (again!). I honestly appreciate that Rhonda. Thank You so much. just made this and i think i'll have a bowl of it for dinner instead of the corned beef/cabbage i cooked!! take a look at Rose Shulman's recipes for avocado smoothies in her column "Recipes for Health" published last week in the Health Section of the N.Y. Times. they, too, feature avocados along with ingredients like pears, ginger, wat.stun..lhey sound yummy! Marvelous image! I need some of this in my backyard! Thank You Dennis. I appreciate it. What a clear picture of the personality and mood of the retired gardener. I may have lived next door to him in Ohio. This makes me want to call him or write a story about him. Thank you, Edward! Thank You so much for your wonderfully kind words. I really appreciate your thoughtfulness. Very cool!! Don’t know how you continually do this! Amazing! You are so very kind Amy. Thank You for your wonderfully thoughtful words. Wow what an awesome picture!! It’s almost 3d and I don’t know if your story is fact or fiction but either way I loved it!! Thank You Deb. I really appreciate it. You are quite kind. Thank You so very much. Coffee in the oversized mug? Hmmm. Glad you have returned and are entertaining with your two cents/sentences. Your photos are inspiring too. 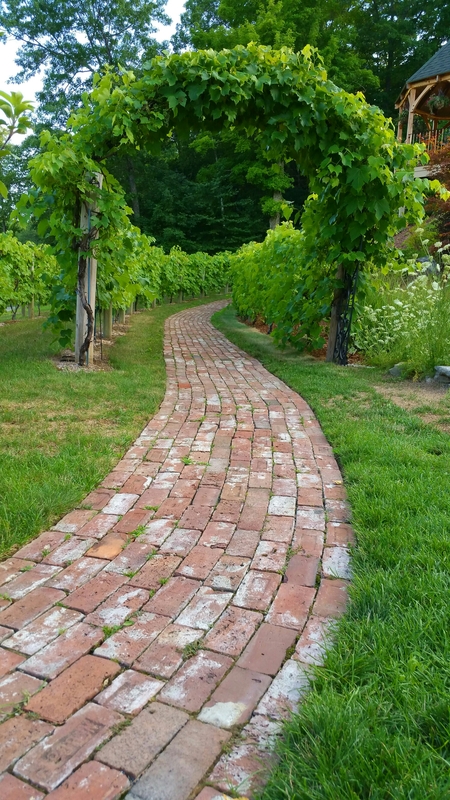 Entering the winding brick walkway, I was lost in thought and words for poetry entered my mind. Thanks for today’s enjoyable visit. Best in 2017! Your kind words are caffeine for inspiration. Thank You so very much Dr. Mary. I love that turn of phrase that my words are caffeine for inspiration. Your thoughtful comment is much appreciated. Best in 2017! Another very good story. And the picture looks fantastic! Thank You so much Nina. I truly appreciate it. Wow indeed….a vivid story unfolds in a sentence. Awesome talent. Thank You for your kind and wonderfully thoughtful words Cristina. I greatly appreciate it. I like the imagery you use in your writing! The picture is amazing too. Thank You for your kind words. I really appreciate it. Thank you for visiting my blog “longitudes.” I like your concept of two sentences at a time. Take your time, you’ll soon have an interesting novel. Perhaps the caffeine will help him make it through the field of poppies. Thank You so much. I honestly appreciate it. I truly appreciate that. Thank You so very much.